John Sung flung all his diplomas into the sea. JOHN SUNG was in a spiritual crisis. The son of a Chinese Methodist preacher, he had thought himself converted at the age of nine. As a teen, he assisted his father and was nicknamed “The Little Preacher.” He traveled to the United States to study science and theology. A brilliant student, he shone in mathematics and chemistry, completing three degrees in five years while at the same time supporting himself with part-time work. Although he organized student religious groups, he began to neglect the Bible and prayer and soon lost interest in Christian matters. In his desire for fame, he even cheated on an exam. All the same, he felt he should satisfy his father who expected him to study theology, so he enrolled at Union Theological Seminary in New York. The school in the 1920s was a bastion of modernism. One of his professors, Henry Emerson Fosdick, denied the bodily resurrection of Christ and other teachings of the Bible, advocating the social gospel. The school’s president, Henry Sloane Coffin, openly scoffed at the Bible. Sung felt a deep unease in his heart and a hunger for something real. He began to read Asian religious works, looking for answers, but his misery deepened. The next day he confronted Fosdick, declaring, “You are of the devil!” When he returned to his room he found himself locked out. Hours later, the door of an insane asylum clanged behind him. In the eyes of Henry Sloane Coffin, Sung’s newfound faith indicated that he had gone mad. The asylum authorities allowed Sung to have a Bible. During the six months he spent in a cell, he read it cover to cover forty times. One-hundred-and-ninety-three days later, a missionary friend, who learned of his incarceration, got him released with the help of the Chinese consulate. Sung sailed back to China, burning with a desire to share God’s word. As he neared his native land, he flung all his awards and diplomas overboard except his doctorate, which he felt he owed to his father. 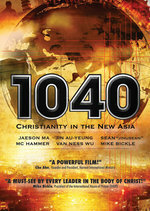 1040: Christianity in the New Asia examines the growth of Christianity in the eastern hemisphere. God used Sung throughout China and Southeast Asia, where listeners wept openly while he preached. Over a hundred thousand people converted to Christianity under his preaching, many confessing their sins openly in the meetings. It was said the tax department could always tell in which city Sung was preaching because the people came forward to confess their cheating and make it right. Sung died at the age of forty-three, having preached for fifteen years.